Since 1954, Grass and Grain has been the meeting place for farmers, ranchers, stockmen and all in agribusiness. 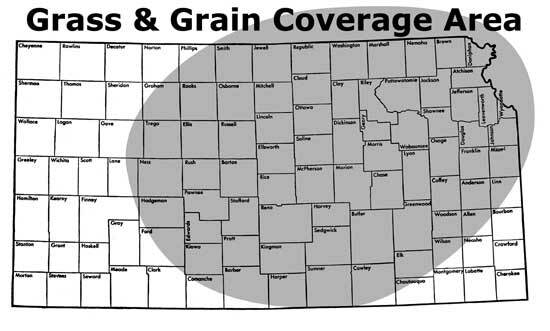 Grass and Grain is the established media of rural Kansas and adjoining states. There is no better place to find what people want and need to know. Our more than 30,000 readers in Kansas, Nebraska, Oklahoma, and Missouri rely on Grass & Grain for current information on important issues in agriculture, entertaining features, auction listings, livestock markets and much more. Auctions, livestock markets, machinery, trucks, livestock and everything else wanted and purchased by families on the farm - and all of those in the agricultural industry - are advertised every Tuesday in Grass and Grain. For information on Grass & Grain advertising, contact one of our experienced sales representatives.